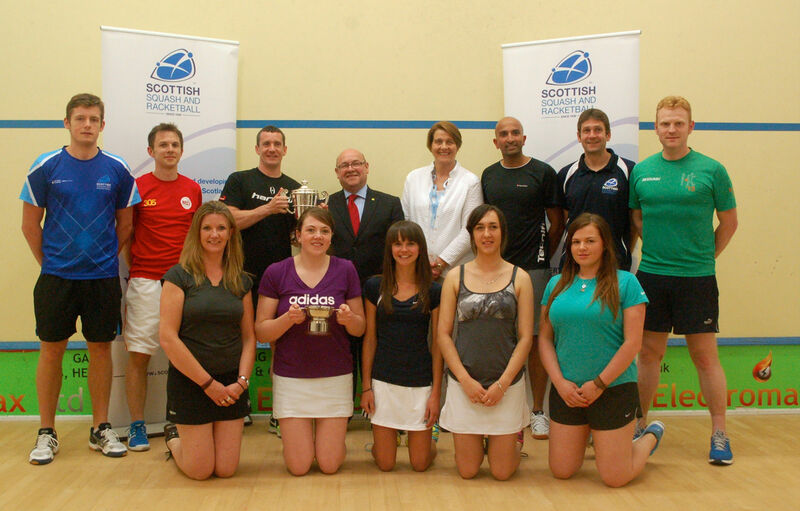 Scottish Squash’s premier club event is the National League played throughout the season. In Season 2013 – 14 SSRL were pleased to not only see an increase in the number of clubs taking part in the Men’s competition but this season also saw the reinstatement of a Women’s National League. Newlands Lawn Tennis and Squash Club in Glasgow won both tournaments and as such have the right to send a team to the European Team Championships in Nottingham in September, and indeed they will be doing so. Trophies and gold medals were presented by James Dornan the MSP for Newlands and Adrienne Airlie, President of Newlands LTSQ. James, whilst happily admitting to not being too familiar with the sport, has been persuaded to return to the club and learn what he has been missing! He said YES! Greg Lobban, Peter O’Hara (junior), Paul Bell, Mark Ford, Christian Donnellan, Angus Woodward, James Singh and Brendan Forrester. Victoria Bell, Taylor Flavell, Amanda Nicoll, Linda Duncan and Morgan McGuire. 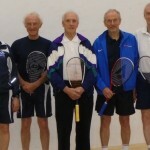 Newlands built their first two squash courts in 1968 as an add on to tennis. Due to the demand a third court was built in 1973. An extensive mini league system was built up with over 125 players in the leagues. This has continued over the years and allows players to play competitive squash at their own level. ln 1991 the arrival of Alan Frame, Scottish lnternational and Scottish Team Manager transformed the competitive edge of squash at the club. Newlands won the first ever Scottish Cup in 1991/1992 with a team of Colin Keith, Allan Thomson, Alan Frame and William Boswell. The club continued to win the National League for the next sixteen years with many international players in the team such as Peter O’Hara (junior), Barry Sutherland, Chris small, Hadrian Stiff (England) and Stevie Richardson (Ireland). ln 1997 on the back of the strong development of squash at the club and the strong financial performance of paying for previous developments Newlands was nominated by Scottish Squash as the Regional Centre for the West of Scotland. The club had a great support from Glasgow City Council who leased land to the club to enable it to expand firstly in 1999 with the building of 4 back to back glass courts and in 2008 the building of 4 indoor tennis courts with the addition of a fully equipped gym. The cost of these developments was 2.2 million. The developments transformed the club from 600 members to over a 1,000 and jobs at the club increase from 2 to 23. The club now runs 8 teams in the West Squash League plus two women’s teams, a national league men’s team and a national league women’s team. An extensive coaching course for juniors has been implemented and the average age of squash teams is now coming down. 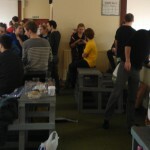 Coaches at the club have been Ken Gibbs, Laura Hamilton and Peter O’Hara (senior). Newlands won both the men’s and women’s National Leagues in Season 2013 – 2014 this year. Both teams will represent Scotland at the European Team Championships in Nottingham in September.